In 2006, Canberra was honoured by a visit from poet and spiritual director, Fr Michael McCarthy. An Irish Catholic priest, Fr McCarthy was spiritual director of ordinands at Ushaw College, Durham, where he became a friend of St. Mark’s Director, Prof. Stephen Pickard, in the 1980s. Sadly, Fr Michael died on 10 July 2018 after a short illness. He is buried in Drimoleague in County Cork. His final collection of poetry was accepted for publication just a few days before his death. 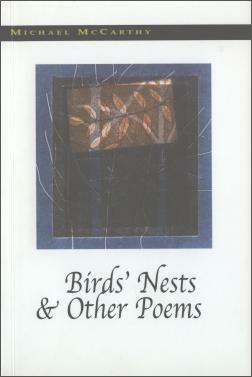 Michael’s first published poem was in 1995 when he was aged age 50. in 1997 he won the Patrick Kavanagh Award for Birds’ Nests and Other Poems. I tracked down a copy. These are the first and the last in the book. the dangerous delirium of flying. we’ll sorrow, salt our crying. until we could see blind. I leave the revellers at midnight. and before answering it, I know. At 9.30pm tonight my mother died. My engines have shut down. I can feel my toes tingle. Yesterday she sat out in the sun. I wait an hour, then call you. as you retell each moment slowly. She told you she was not. with the final rites, the day went quietly. She slept a little now and then. In the evening she told Ita she was going. In the event she didn’t. distress. You say there was none. there are nine messages on my Ansaphone. I don’t need to answer them. I check the Internet for flights, then walk outside. In a while I hear the first birds sing.